Downy, or hairy or foo foo bird. I always confuse the two. I love watching the birds but always worry about them in the winter. I put water out for them and it froze in an hour. I think I need a heater. Poor birdy looks cold! Great catch Margaret. This is beautiful! Great capture, Maggie! I love the falling snow! and what will poor robin do then ,poor thing. And tuck his wee head under his wing,poor thing. Brrr .. Poor thing! Still waiting for snow here! @june I love that. It fits well with this shot. that is quite a nasty looking storm! I'm sure the birds appreciate your efforts to help them through. Looks like a Downy to me, smaller with marked outer tail feathers. Nice shot, I guess you could put a low watt light bulb under the water dish to keep it from freezing. A submersible aquarium heater would work too. Luv this capture and luv that falling snow! This is an amazing capture. 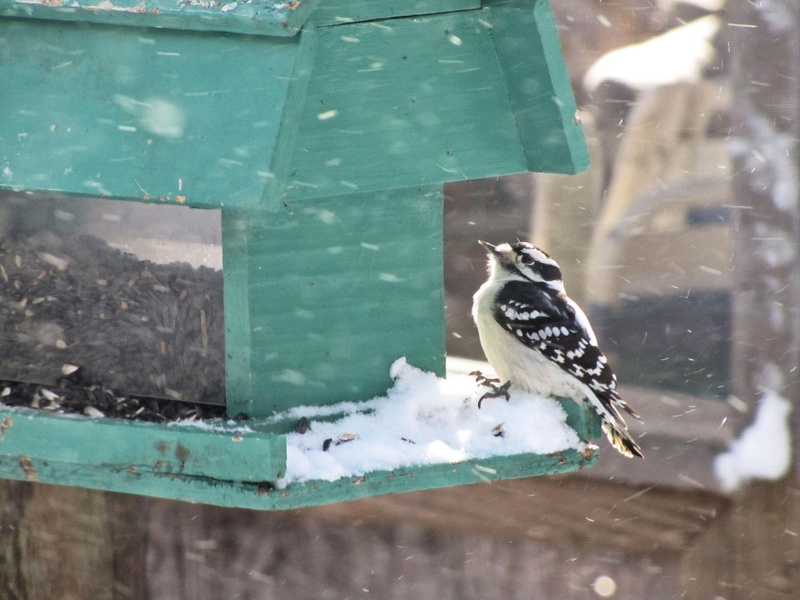 Love the DOF - the composition and I am impressed with how clear the bird is and how you captured the snow! burrrr.... looks super cold, we haven't had much of any snow yet, quite unusual for us. feel sorry for the little birdie, looks like he's holding on for dear life!!! Aw! poor sweet bird! I always feel sad for birds in the wintertime. Poor birdie looks cold. Great capture of him though. Love the snowflakes, too. what a little cutie, love the bird feeder, he does look a bit on the cold side, but then you are in your winter months. brrrrrrrrrrr. I haven't seen one f these birds before , its really cute I am sure it must be grateful for the food you put out . Lovely shot. Excellent shot Marg, but I've changed my mind, I don't miss the snow. It's cold here now too. Gorgeous! Do they not fly south were it is warmer! @doglady Today was cold, but the snow stopped. We didn't get much. A few inches. @twinsplusone Sharen, these birds stay all year. Quite a few of them do. They survive the winter somehow. Something about the snow makes bird pictures especially nice. Nice capture. The bird looks small so it must be a downy or a young bird. Probably a female. I don't see how these little creature survive the cold but they seem to make it just fine. the foo foo bird looks really cold :( love this shot!! Nice capture :-) I always feel sad (like they were left behind) for the birds in winter too. Beautiful capture of this bird in the snow! Looking for a little shelter . . how beautiful this is . . love the color tones and snow coming down. Poor little guy! Neat capture. You have more snow than we do. The spots on the bird match the snow so well. FAV! It does look mighty cold out there, and a heater would really be nice for their bath. Oh wow, the water freezes in an hour....never, ever gets that cold here, what shot though. Its a wonder the little birds don't freeze! We have a downey roosting in one of our birdhouses. Such lovely birds and you captured him so well. I love this photo...I can feel the winter air just looking at it...great capture! Oh, so sweet! I love this! I wonder how do these tiny creatures the harsh winters!? Love the story behind the story. I was only telling my husband this weekend I worry about the birds here as we can get very hot and there is not much water around for them to drink. Beautiful capture! I would like a heated bird bath for the birds too. Nice shot Margaret! So cold........! Lots of motion here! I get chills looking at this little one! It looks so cold and windy! Poor little bird. Great shot, there! I'm with you - I can only tell them apart if they're side-by-side! This little guy sure looks c-c-c-cold! He looks like he is stuck on the ice! ARen't you good to look after these little birds. Great photo. He does look a bit frozen! Nice pic. The black and white really makes the bird stand out! I wonder why they do not fly south, silly birds...AND I wonder how they do not freeze- Guess winter is in full force now? LOL! This little fatso doesn't look like he's going hungry anytime soon! Love the sunlit snow again! Love watching the birds too, but i can never get a good capture of them, This is brilliant. oh my gosh he almost looks like he shivering....or maybe thats just me looking at all that snow! this is sooo wintry! great shot, fav! @ellen I can always count on Rob or Brian to know what they are. Awesome! Makes me wish it would finally snow here...ha! Wow! What a great action shot!